This Real Butterfly Wing Ring is made with Dacalana monsapona aka double tufted royals blue hairstreak species. Butterfly died after its lifespan of 3 weeks. Purchases help save butterfly population and rain-forest. 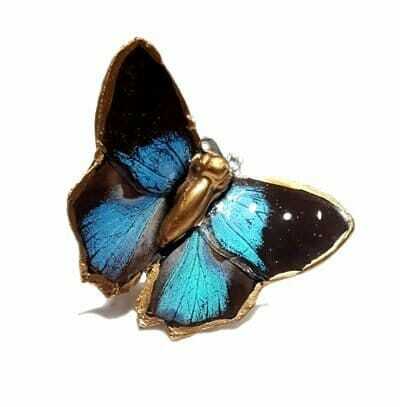 I love this real butterfly wing ring. I keep one for myself. It’s absolutely beautiful. This real butterfly wing ring design is exclusive at The Blue Goddess Co. We are the leading experts on real butterfly wing jewelry. Coated in resin for longevity. Sterling Silver Plated Adjustable Filigree Band. Body is Ceramic with Gold Leaf. 0.25″ Ceramic Backing with Gold Leaf.